VIC Metro has recorded a comprehensive 45-point win over Central Allies to end their successful AFL Women’s Under 18 Championships. Breathing fire from their loss to Queensland on Wednesday, the Victorian side was back to its menacing best early as Calder stars Maddy Prespakis and Georgia Patrikios lit it up from the midfield, causing damage going into the forward 50. The damage was quite literal from Prespakis’ end as a tackle in the last minute of the term saw Bella Smith stretchered off, with goals from Holly Bate, Daisy Bateman and Gabby Newton seeing Metro to a 13-point lead at the first break. Montana McKinnon marked everything early for the Allies, while Rachelle Martin snared their sole goal with a snap. 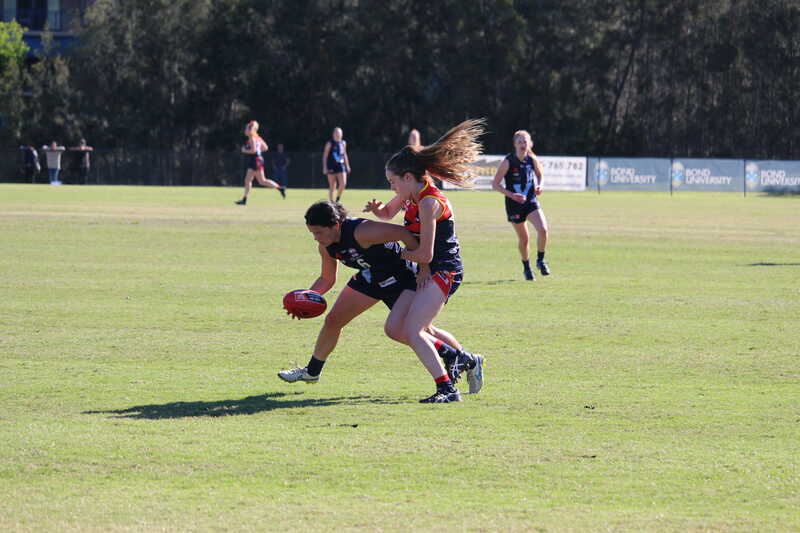 It was more of the same in the second term as Cleo Saxon-Jones and Britney Gutknecht hit the scoreboard for Metro with Prespakis again at her damaging best, while McKinnon’s marking display continued for Central, with Hannah Munyard finding plenty of the ball. Metro were unlucky not to go into the main break with a bigger buffer, as the likes of Bateman and Bate were in everything inside forward 50 – instead, the margin stood at 25 points. With Central Allies held to just a sole behind in each of the second and third quarters, Metro shot out to 51-point lead going into the final break with Bateman and Newton booting their second majors, while Prespakis also found her way onto the scoresheet with 1.2 and plenty of forward run. Amber Ward and Nikki Gore were solid for Central in the ‘premiership quarter’ but could do little to stop the onslaught. 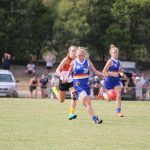 Despite Metro’s Gutknecht claiming her second major to start the term, Central did well to pull the margin back with goals to Danielle Ponter and Katelyn Rosenzweig, while Madison Bennett looked dangerous despite copping a hard knock up forward. Metro’s Mikala Cann and Sarah Sansonetti contributed well coming out of defence in the final term as the ball spent a lot of time there in a tighter end to the contest. Munyard, McKinnon and Madeline Gault were fantastic all day for the Allies, while Prespakis dominated from midfield and half-forward alongside the likes of Bateman, Patrikios and Katie Lynch to notch their big win. 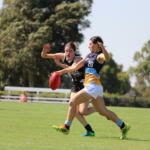 VIC METRO: Gabby Newton 2, Daisy Bateman 2, Britney Gutknecht 2, Cleo Saxon-Jones, Holly Bate, Madison Prespakis, Georgia Patrikios. CENTRAL ALLIES: Danielle Ponter, Katelyn Rosenzweig, Rachelle Martin. VIC Metro is one of the favourites to win the AFL Women’s Under 18 Championships. With plenty of firepower and a win under its belt already, the side is in good stead to have a successful tournament. We took a look at the side’s key players and its upcoming fixture ahead of round two of the National Championships on the Gold Coast. We took a look at the side’s key players and its upcoming fixture ahead of round two of the National Championships on the Gold Coast. Prespakis was the game-changer in Vic Metro’s win over Vic Country, kicking two goals in a matter of minutes to put the game beyond reach. The Metro captain is a versatile player who can make an impact both in the midfield and up forward. Her list of accolades is truly remarkable, as it includes winning the Calder Cannons Best and Fairest by 58 votes this year, being named as last year’s Vic Metro MVP and earning a spot in the 2017 All Australian side. Prespakis is one of the most damaging female footballers and has a game that is unique to any other. It will be hard to stop her at the carnival. 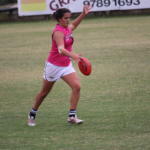 Macpherson had one of the best sets of hands in the TAC Cup Girls competition. She often created a wall in the back line, and took every mark that came her way. She repeated those same efforts in Metro’s win over Country, rebounding the ball sensationally well in the side’s defensive 50. Macpherson won the Eastern Ranges’ Best and Fairest last year and could be a chance to win it again, despite missing some games during the season due to concussion. She is a reliable player that can patrol the back line with ease. Lynch is a remarkable midfielder with plenty of X-factor. She played limited games for the Oakleigh Chargers this season due to school commitments, which made you want to see more of her. She has a penetrating kick that sends the ball forward for her side, which was invaluable during the TAC Cup Girls season as well as Metro’s victory against Country. Lynch is another versatile player who can roll back or forward when needed to, and is a player that gives her all. Her hands are another asset of her game and will be key at the Gold Coast. Eleanor Brown was sensational for the Sandringham Dragons this season. Playing in the midfield, her long kicks and clean hands resulted in incredible ball movement on her part. Brown has been rewarded for her efforts this season with a spot in the Southern Saints Victorian Football League (VFL) Women’s team and has starred in her two games for the side. She is a player that can not only rack up heaps of the footy, but can use it well, which she will be able to do on the Gold Coast. It’s hard to go past her tackling as well, as it often stops opponents in their tracks. Gabby Newton is a serious game-changer. She has the power to single-handedly turn games on their heads. She had a stint at every position this year, excelling especially in the midfield where she was able to penetrate the ball forward with her long kicks. Her running is a highlight of her game and her tackling is immensely strong. At just 16 years of age, she has been playing against girls who are one or two years older than her, and is able to match it right up to them. Expect her to do the same at the Gold Coast, as she is in red-hot form, coming off a TAC Cup Girls Grand Final and a Northern Knights Best and Fairest win. The Oakleigh Chargers forward is a traditional goal-sneak. She positions herself well against bigger bodies, is able to push her opponent under the ball and has great speed out the back of a contest. She averaged two goals a game during the TAC Cup Girls season, kicking 14 goals from seven games. 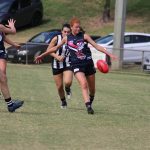 Thanks to Collingwood’s strong connection with Oakleigh and her solid TAC Cup Girls season, the Magpies VFLW side welcomed Bateman into the side. 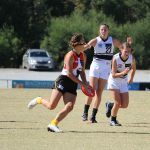 On debut, she kicked three goals and in her second game, she booted another two majors, proving that she can match it up with any player of any size, which will be a dangerous prospect for the other U18 sides. 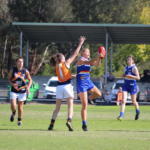 The smooth-moving tall is a potential father-daughter selection for the Western Bulldogs in the 2019 National AFL Women’s Draft. She is the ultimate utility, playing everywhere from forward to back and through midfield. Expect her to predominantly play up forward for Country and prove to cause all sorts of headaches for opposition coaches. She is strong overhead, athletic and uses her bigger frame to influence the contest in the middle. Arguably the most exciting player in the team, Patrikios certainly provides the X-factor up forward. Much like Newton and Grant, Patrikios is a player who is not eligible to be drafted until next year, but is already playing at a top-age ability level. She could well walk away as one of the leading goal kickers from the carnival and is one of the many options Vic Metro has up front, and is expected to excite fans with her agility and ability to create something out of nothing in front of goals. This match sees two reigning All Australian stars go head-to-head. The battle between Western Australia’s McKenzie Dowrick and Vic Metro’s Madison Prespakis will be fantastic to watch, as both players are supreme ball movers. They can both also provide X factor in their games, which is a mouthwatering prospect for all female football fans. Georgia Macpherson or fellow key back and Eastern Ranges teammate, Charlotte Wilson could likely get the match-up on Black Swans forward, Kate Bartlett, who is no stranger to kicking goals, as she kicked seven goals against the NSW/ ACT during last year’s championships. All eyes will be on the ruck match-up in this game, as Queensland ruck, Lauren Bella is damaging at her best. For Vic Metro, the ruck duties will likely be rotated between Eastern Ranges’ Sarah Kendall and Calder Cannons’ Carla Rendelmann. Both have had good TAC Cup Girls seasons and are currently in VFLW sides. It will be fascinating to see these players go head-to-head. It will also be interesting to see how Queensland’s Zimmorlei Farquharson and Metro’s Mikala Cann will fare in this match, as both have incredible athleticism and are exciting to watch. Vic Metro will need an agile defender to go with dangerous forward, Danielle Ponter, as she is a wonderful mover inside 50. Ponter has been starring for Essendon’s VFLW side and is one of their most important players. We could see the likes of Northern Knights’ Sarah Sansonetti or Calder Cannons’ Molly Warburton take the job on Ponter, as both can play a brilliant lock-down role and can move well with the play. 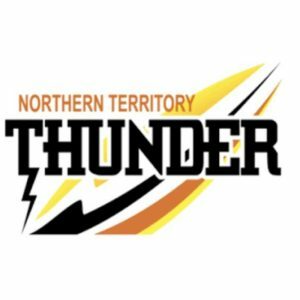 NT Thunder quartet, Nikki Gore, Janet Baird, Tabitha May and Madeline Gault will be hard to bring down, and could be a challenge for the potent Vic Metro side.